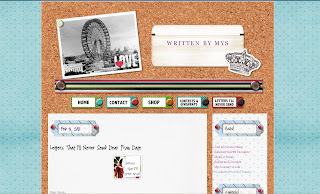 It used to be called Thoughts and Obsessions but when Mys came back after the Holidays, true to her word, she indeed revamped her blog. She gave it an all new look and officially baptized it Written By Mys. I was a bit confused to see that it had a different name but I loved the new layout: two column, a soft old blue dotted background and a bulletin board feel. I love the tacks, the sidebar and title header fonts which gave it a more personal appeal. This is one of the blogs that has caught my attention because of Mys' writing style: straight to the point, honest, and personal. And oh, she has decided to write her entries diary style. This blog is home to the meme Letters That I'll Never Sent. Although it hasn't seen much participants since it's conception last August 2009, I seem to be enjoying writing these letters. Personally, I love doing this meme because it challenges me as a writer. The various themes for each week presents an opportunity to be creative and go beyond the ordinary. And for that Mys, I am thankful. Her movie reviews for TCP are a must read. She never fails to give her thoughts about the movies that she features and is generous enough to share a trivia or two about it. Tuesdays always mean anticipating her movie review. Hehe! She also loves to participate in memes and she has a number which she participates in regularly: Girls Talk, TCP, With Love Wednesday, Monday Mayhem, Friday Follow to name a few. Should you run out of ideas on what to write, visit her blog for those memes. You can join in the fun too. So what are you waiting for? Click on the link to her site and read on! You will see why I love this blog! Super thank you for this wonderful review. I'm so touched. I thought I'd already left a comment, hay, naabutan ako ng paghang ng pc. Thanks a lot.